On New Year’s Day, Diane and I were in Weston, Florida with our daughter Jeri, her husband Tom, and boys Dylan and Gavin. We decided to celebrate New Year’s Day by going kite flying at one of the really nice Weston City Parks. This one was a converted landfill, which reminded me of Mount Trashmore in Virginia Beach. We had been in Weston since the 20th of December and our two weeks there was winding down. We would soon be off to our next stop in Brooksville. We hated to say goodbye to Jeri and Family but we had to go. You have to book a spot way in advance if you are a Florida Snowbird and if you need or want to make changes to your reservations, that has to be done early also, if you can make changes at all. So the evening of January the fourth, we parked our coach on our rented spot at Belle Parc RV resort. It is a nice park, however at that time it was still undergoing a major renovation. Water retention ponds were being enlarged and new ones being constructed and as a result dump trucks rumbled by our spot every weekday, most of the day, for too many weeks. It became a bit nerve-racking. In spite of the noise we liked the place and still do. We made new friends. We played shuffleboard, which I enjoy very much. Diane taught a group of folks how to play Mahjong, quite a feat, if you ask me, I don’t know how to play. We also went kayaking on a lot of different rivers close by. Now that was a real treat that we are looking forward to again. Our first kayak trip of the year was with new fiends Jim, and Kathleen. We met them the previous month at Thousand Trails Orlando. They own an inflatable kayak so we decided to go to Rogers Park in Weeki Watchee Springs and paddle up stream into the Weeki Watchee state park. We had a little mis-adventure traveling to the park. We inflated our Sea Eagle kayak and stowed it in the back of their pickup truck. We should not have left the inflatable seats in the kayak because we discovered at some point along the way, that one seat had flown the coop. We turned around and spent quite a bit of time retracing our route, looking at the side of the road for our white seat, The seat was gone, for good, as it turned out. We would have to order another one. Live and learn. Don’t leave your removable seats in a kayak in the back of a pickup. The trip up and down the river was still fun, and lunch of conch fritters and fish tacos at the Upper Deck Restaurant, right by our take out spot, was really good. We drove back to Belle Parc in a Florida winter thunderstorm, but a rainbow was waiting for us. Just a few days later, we packed up the coach and headed for the Tampa RV super Show at the Florida Fairgrounds. We would be helping to set up and man the Deer Creek Motorcoach Resort booth. It was about to become a very, very, busy week. Diane and I shopped for a bunch of things we needed in the booth. We arrived early the next morning, helped set it up and the show began. Lots of folks dropped by, including the Sweeney Brothers, a performing Bluegrass Comedy Band, that was roaming thru the event hall. They saw that Diane had a dulcimer, stopped and asked if she actually played it. When she said “Why yes I do” they asked to hear it and then joined in with her. When they did a crowd formed, cell phones came out to take pictures, and a reporter was there. Diane and the Sweeneys were on the early morning Tampa news the very next day. They played with her a couple more times during the show as well. Yes I did get a bit bored one day, so I went back to the coach for a few minutes and returned as Forest Gump. I even brought my Jenny Boat. The show lasted five days, it was a lot of work and we returned to Belle Parc, tired, but glad we had done our part to help out our Galax home. If you watch the video or fast forward to about 7 minutes in you will see something speacial. We attended the Brooksville Greek Festival in late January. It was okay, the food was not great with the baked goods being the exception. There were a few vendors, some from Tarpon Springs. Diane and I went in together and bought some nice bars of soap. Oh, there was a belly dancer who thrilled some of the older gents, not sure I was one of them. We settled in for our remaining two months stay at Belle Parc. This of course meant that two things would happen for sure, more kayak trips, and a trip to Tarpon Springs. I call it a pilgrimage to Tarpon Springs. Diane is a good Greek Girl, so we have to go there, and I don’t mind that one bit. The next kayak trip was with the Bell Parc folks and there were quite a few of us. We shuttled each other to the Withlacoochee River state park. This river is not clear blue as others, it has a lot of tannin in the water which makes it look like tea. It has lots of turtles and gators. It was a four hour trip and we enjoyed every minute of it. Next trip, Tarpon Springs. We drove to New Port Richey to meet our good friend Joan, one of our DCMR neighbors, and take her with us to Tarpon Springs. We had a great lunch at Hela’s Restaurant and Bakery, did a bit of shopping. We also sat in the square outside and listened to the violin music of Cal Morris street performer, extraordinaire. He is very good. Joan purchased at least one of his CDs. Cal is also a fellow Squarespace.com user. I have to notice and appreciate that. Calmorrismusic.com is a very good looking website by the way. Belle Parc is a really nice place and its affordable too, and that description of any RV place in Florida during the winter is rare. We are glad to be returning there in January. We made quite a few new friends. Diane joined a group of dulcimer players in the park. They play old time music, mostly well known popular songs as opposed to mountain old time music. She enjoyed being with them and took a field trip with them to Dunedin, Florida to attend classes held by Tull Glazener, a well known mountain dulcimer player and instructor. I think I mentioned earlier that I really like to play shuffleboard (I am a mean player!) and I found some folks who enjoy playing it as well. I took it upon myself to repaint the lines on the two old courts. I also purchased a storage box for the pucks that I repainted as well and gave them a good coat of wax. The park provided a container of glass beads, and I made a small shaker to apply them to the courts. After that the somewhat slow courts became very slick and playing on them required more finesse than muscle, which is the way I like it. I plan to look after the newly resurfaced courts again when we return. The town of Brooksville is a nice comfortable place to spend the winter. It is a small town, that reminds us of Galax. It has a lot of live oak trees covered with Spanish Moss, and lots of azaleas that bloom very early in March. Azaleas are one of Diane’s favorite flowers. We enjoyed a lot of the local restaurants in town and in the surrounding area including the famous Florida Cracker Kitchen just outside downtown Brooksville, great shrimp and grits and the Old World Restaurant in Floral City. They make really good German Food, a rare treat in my opinion. I have to mention The Rising Sun Cafe in downtown Brooksville. We went there with a group of Belle Parc folk for open mike talent night. Diane thought about playing her dulcimer, but because the crowd was somewhat loud, didn’t think it would be heard, maybe next year she will play her new one with the big sound. We shall see. One of our neighbors at Belle Parc is a water color artist and painted this for the three of us. The middle of February had one incident that was hectic and scary. Late one night Teddy Bear’s breathing became very fast and raspy. He looked like he was in distress. He had coughed quite a bit while walking earlier in the evening. He coughed up some think white foam, after lunging at something and pulling his leash hard. We didn’t know what was going on. Did he have kennel cough? Did he aspirate something while eating or drinking? We had no idea. I called an emergency vet, described the symptoms and was told to bring him in. After examining him, which didn’t provide an answer, the doctor took an X-Ray and then the bad news was delivered to us. Teddy Bear was in heart failure. His heart had enlarged and his lungs were filling with fluid, one worse than the other. We were not sure he would make it thru the night, but after a massive dose if Lasix delivered by IV, some additional heart medication and a lot of prayer he started to recover. The vet wanted us to leave him overnight, but he stressed out so badly that she called and told us to come back and get him, which of course we did. Since that time his health has been stable, if not totally okay. He is on meds still, twice a day, and an extra Lasix if needed. He eats well, a salt free diet, which means less dog treats and other changes that he doesn’t quite like. Anyway, that is another story, one that is still taking place. The water runs clear around The Crack, a zigzagging fissure that snakes for about 30 feet above one of the many springs flowing into the Chassahowitzka River. Brooksville is on Florida’s Nature Coast and I think it is worth repeating, one of the very best things about spending the winter there is the rivers around us. Crystal River, Three Sisters Springs, Wiki Watchee, the Chassahowitzka River, and Homosassa Springs. We made a late trip to Homosassa Springs State Park. It is a beautiful place, great trails, with manatee lectures, and an underwater observation “deck”. I think the pictures above and below speak for themselves. Our time on Florida’s Nature Coast came to an end on the Fourth of April, but something interesting happened first, a couple of weeks earlier to be exact. As you may know, I love to fly kites. Two of my kites are black para-sail octopus kites. 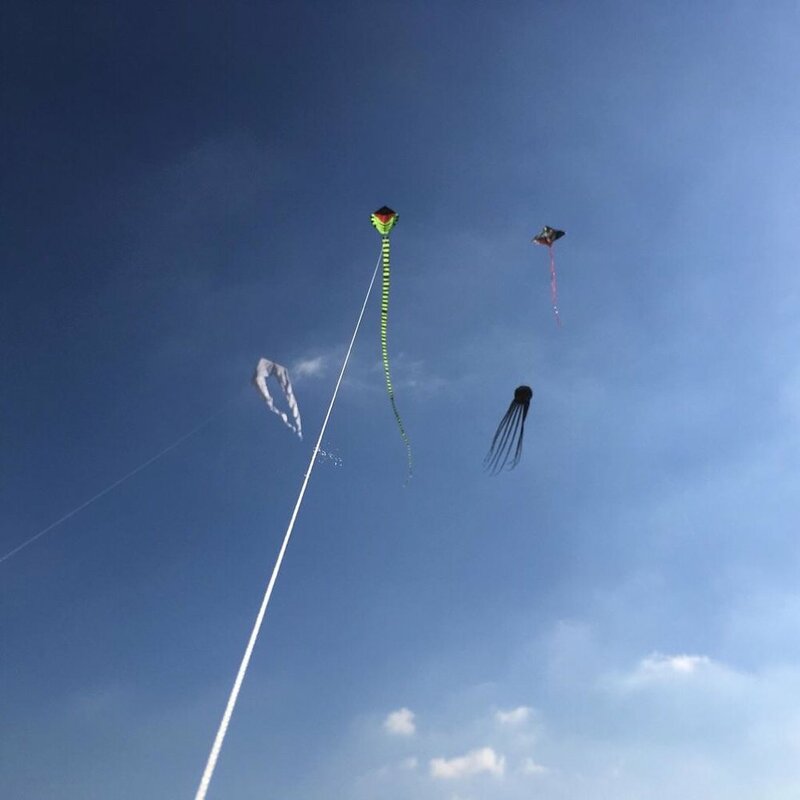 Each has eight long tails or arms depending how you view it and a lot of cell strings that holds each section or cell of the kite open which allows the kite to fill with air and take off. I was flying one, the only one I owned at the time, one typical Belle Parc windy day. There is a large empty grass space in of the spot we were parked on, just next to the pool and shuffleboard courts. The kite was flying high over a very tall live oak when the wind suddenly died and the kite quickly drifted down, to quick for me to reel it in over that dangerous tree. The kite landed in the tree and tangled itself around numerous branches. It was stuck fast and hard. I now knew how Charlie Brown must feel when a tree eats his kite. Neither a strong wind or a heavy rain shifted that kite from the trees grasp. For almost two weeks I would see it sag and move, which would get my hopes up but nothing would bring my kite down. I could sit in the coach and watch my kite wave back and forth, and it made me sad. Then one day we had a really bad thunderstorm, high winds and lightning, strong hard rain that left a bit of tree damage, not the one my kite was in however. A few days later, a tree service came into the park. One of my neighbors, who had been trying to figure out a method of retrieving my kite, told me the tree people were in the back of the park removing a broken tree. I ran back there to see them and asked that they perform a gallant rescue of a large black nylon octopus. To my surprise and relief they agreed, at no charge I might add. Two days after my kite was rescued Diane and I made a return trip to Tarpon Springs. Once again we had lunch at Hella’s Resturaunt and Bakery, and visited the stores that we like the most, including the local Greek Agora where we bought olive oil, Feta cheese and a few other imported things. Cal Morris was there again and so was his twin brother, Daniel, who plays the viola. Together they made wonderful music. We had a very good time, but our time in Brooksville and the Nature Coast was over, time to pack up and roll our way over to Orlando. The next three months will be posted quicker than you can say Withlacoochee river.